I adapted this from a recipe that is on http://epicurious.com I had a lot of red onions and thought of a soup because it was a rainy day. It was one of those lovely unexpected rains that brought a cool wind and lowered temperatures considerably. 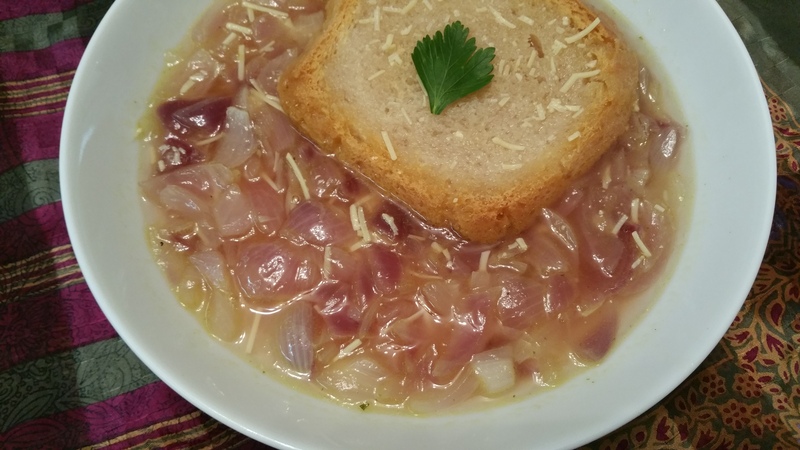 For June, that was unusual and I figured an onion soup would be a great remedy! The flavour is wonderful! 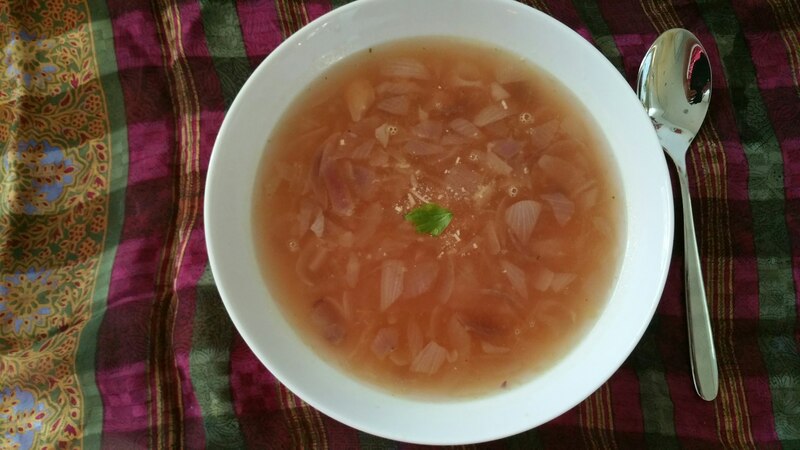 The addition of star anise is what really gives this soup its great flavour as well as the yummy red onions. It is even better the next day. Bring broth, water, spices, and 1/2 teaspoon salt to a boil. Remove from heat and let steep 15 minutes. Meanwhile, cook onions in oil with 1/4 teaspoon salt in a heavy medium pot over medium heat, covered, stirring occasionally, until deep golden, about 15 minutes. Add wine and boil, uncovered, until reduced to 2 tablespoons, about 1 minute. Strain broth through a sieve into onion mixture and briskly simmer, uncovered, 10 minutes. Season with salt. I don’t have a broiler but here are the rest of the instructions for the bread and cheese. I just put some toasts and sprinkled some cheese. I didn’t put much because I did not want the cheese to take away from the rich flavour of the soup. You decide what you think is best. Ladle soup into 4 ovenproof bowls set in a 4-sided sheet pan. Place baguette slices on top and sprinkle each with 1/2 cup cheese. Broil about 6 inches from heat until cheese is melted and bubbling, about 2 minutes.